Montreal and Vancouver are among 16 cities participating in Reinventing Cities, a global competition aimed at transforming underused publicly owned sites into sustainable, carbon-neutral urban renewal projects. Winning bids from developers, architects and neighbourhood groups will need to demonstrate how they can develop carbon-neutral projects combining noteworthy architecture and local community benefits. It must also be possible to replicate similar projects worldwide. The competition is being organized by the C40 Cities Climate Leadership Group, which connects 90 cities worldwide containing more than 650 million people. It’s chaired by Paris mayor Anne Hidalgo. The president of the board is former New York City mayor Michael Bloomberg. Reinventing Cities aims to drive collaboration between the cities and private sector to deliver new approaches to reduce the impact of building emissions. Buildings account for 50 per cent of emissions in C40 Cities and to meet the Paris agreement on climate change, cities need new buildings to be as close to zero carbon as possible. Existing buildings need high levels of retrofit. 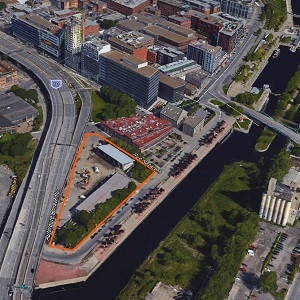 Montreal is calling for proposals to redevelop the 107,000-square-foot de la Commune service yard in the Cité Multimédia area at the west-end of Old Montreal. Cité Multimédia was once home to a number of abandoned 19th-century industrial buildings, but now houses several high-tech companies. Montreal’s site can be developed into a mixed-use project that could incorporate residential, commercial, industrial and institutional uses. A rebuilt municipal rail yard must also be integrated into the project. “It’s a super strategic site in Montreal,” says Josée Chiasson, director, economic clusters development, in the city of Montreal’s economic development department. She described Montreal’s participation in Reinventing Cities at a recent strategic forum on major real estate projects in the city organized by the Montreal Board of Trade. The site, between Griffintown and the Old Port, serves as the entry point to downtown Montreal from what was the Bonaventure Expressway but is now an urban boulevard (Robert Bourassa Blvd.). It’s well served by public transit and is crossed by a bike path. The city of Montreal plans to sell the property at fair market value to the winner of the call for proposals. Vancouver is seeking proposals to develop part of the Vancouver Innovation Hub, a mixed-use site located in the emerging economic inner-city neighbourhood of False Creek Flats. The 65,000-square-foot site could be used for a variety of different uses, including a centre of food excellence, a variety of spaces to support light industrial start-ups and accelerators, affordable industrial spaces for social enterprises and non-profit organizations and a variety of residential uses. Vancouver will make properties on the site available in the form of a long-term lease of 75 to 99 years. Among the other participating cities in Reinventing Cities are Cape Town, Chicago, Mexico City, Rio de Janeiro and San Francisco. Other projects include redevelopments of abandoned buildings, historical mansions, underused markets, a former airport site, parking lots, an abandoned incinerator and a landfill. Chiasson and Véronique Doucet from the City of Montreal’s economic development department noted Montreal has an “an enormous amount of potential for development” beyond its Reinventing Cities site. They say the city has about 50 million square feet of vacant land available and about 7.85 million square feet of vacant buildings that can be reused for development. Reinventing Cities was inspired by the successful Reinventing Paris scheme, launched in the French Capital in 2015, which is seeing the transformation of 22 public spaces covering 2.7 million square feet. The deadline for Reinventing Cities applications for the Montreal and Vancouver projects is May 31.